It was cold, it was wet and the simple, intimate, private wedding of Mark & Jacquie could not have been more wonderful. Why? Because they were in love, and it would take a whole lot more than some water falling on them to dampen their wedding day enthusiasm. 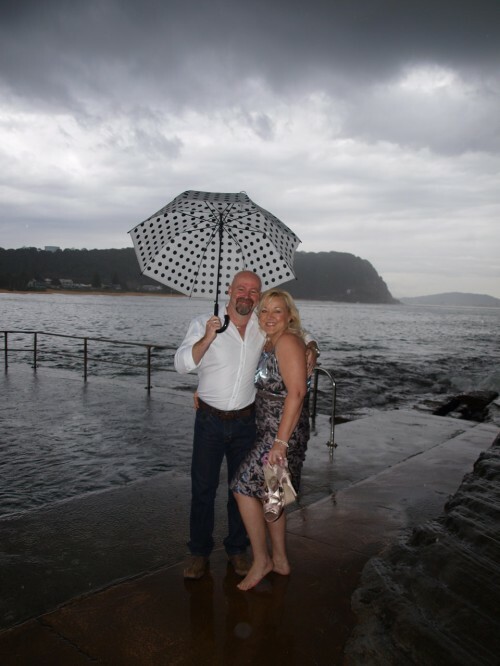 The rain started as our wedding party of 5 walked across the sand at Pearl Beach and it refused to stop. Our bride Jacquie held her shoes in her hand, will good intentions of putting them on once we were off the sand. The shoes never made it on to her her feet! We had to run across sand, wade through a newly formed channel, and scramble over rocks. Not the sort of terrain for a high heel, but an ideal way to see that when the Groom kissed his Bride, we could actually see her toes curl in excitement! It was possibly the most fun I’ve ever had! There was nothing formal or traditional, just two people exchanging their heartfelt vows at what proved to be a gorgeous backdrop, despite the weather. They even got congratulated by a beach fisherman as we sprinted past on the soggy sand! These are their own special intimate memories of their day, and I’m fairly certain the rain made it even more memorable. Think you would like to Get JUST Married®? Support Marriage Equality? I do.